The 2018 Ironman season came to a close with two races over the weekend. 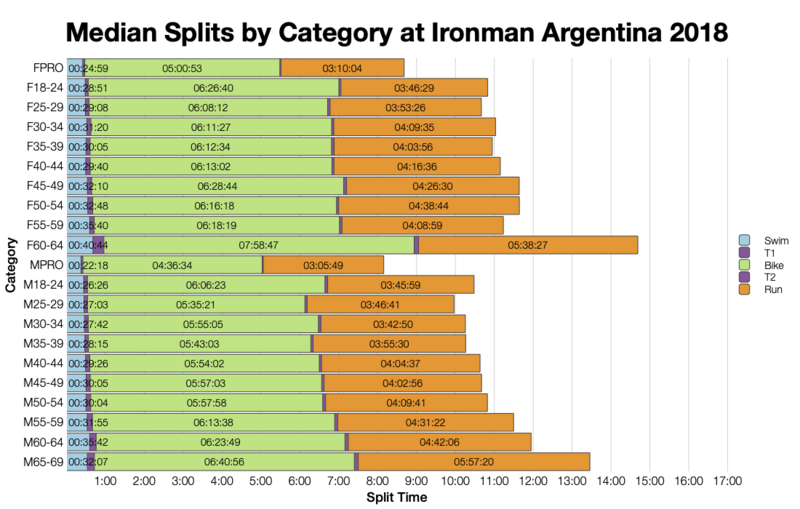 The first I’ll review is Ironman Argentina, the South American Ironman Championship. 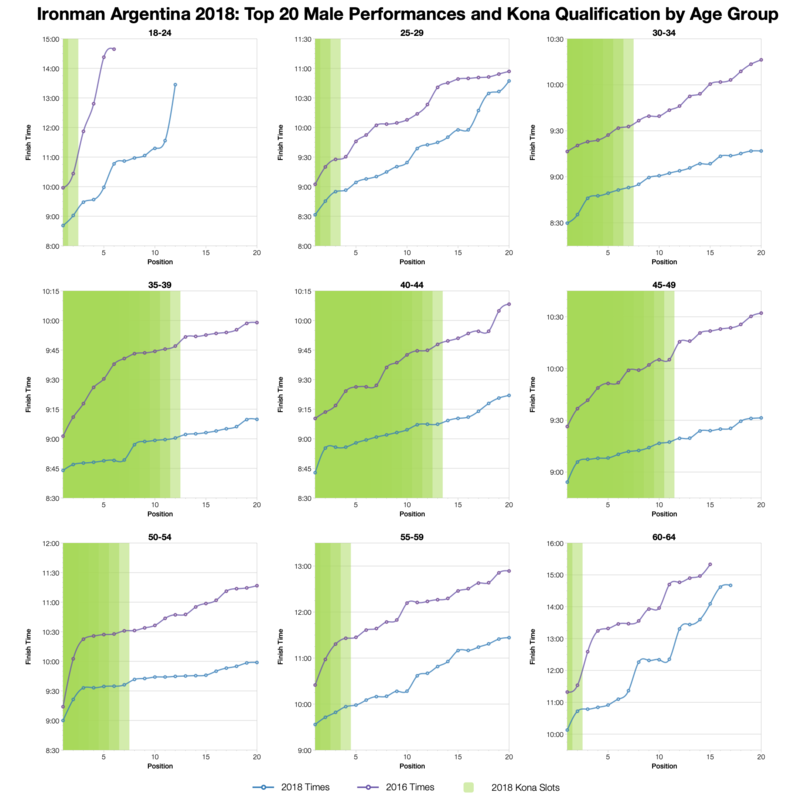 As a championship race there were 75 age group Kona slots on offer for the 830 athletes who raced on Sunday; one slot for every 11 athletes racing makes for good qualification odds. This year’s race was much faster than 2017 thanks to a significantly reduced swim. 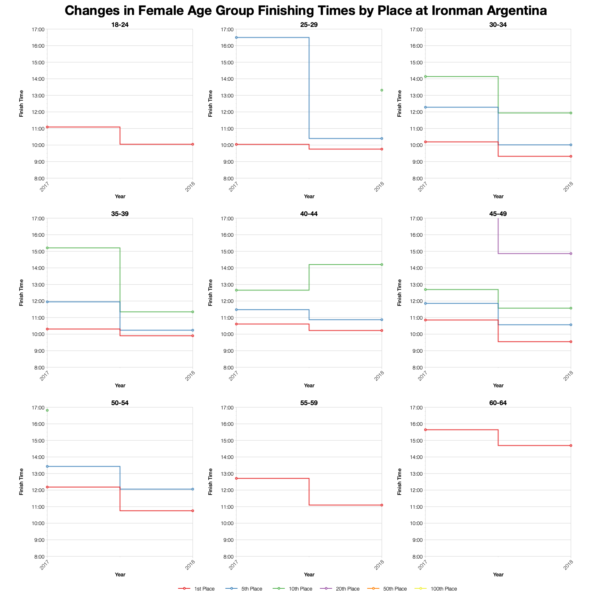 A shortened swim limits comparison with the previous year of racing in Argentina. Swim times are at least 45 minutes faster than in 2017 which ensures a faster overall race. Following the swim both bike and run trend faster too. The difference is small on the bike, but run splits trends around 10 minutes faster at the median. So we have a shortened and consequently faster race that can’t easily be compared with the previous year. Results from 2017 don’t contain any DNF information. 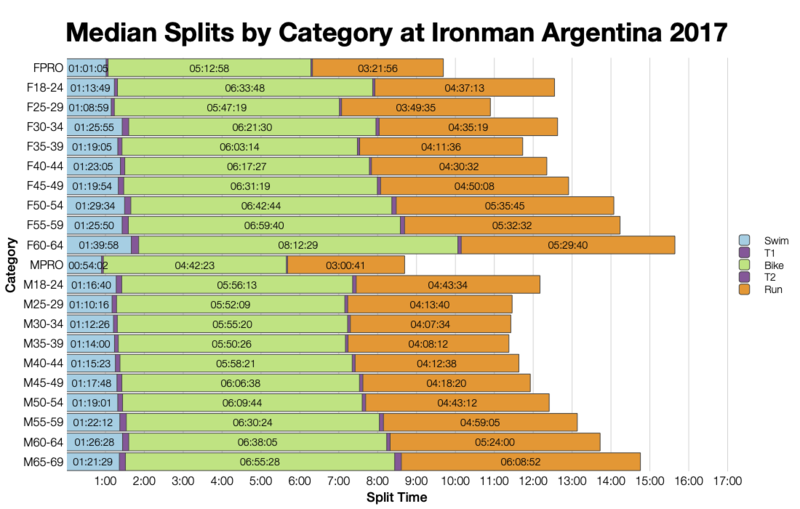 It’s unlikely an Ironman finishes with such a high completion rate. It appears the DNF results simply weren’t included at the time. This year’s data is better and shows a course that does have a low level of DNF throughout. As with the distributions, the shortened swim means we can only make limited comparisons of the age group medians. Along with this, being a smaller race means there’s much more variance between age groups. 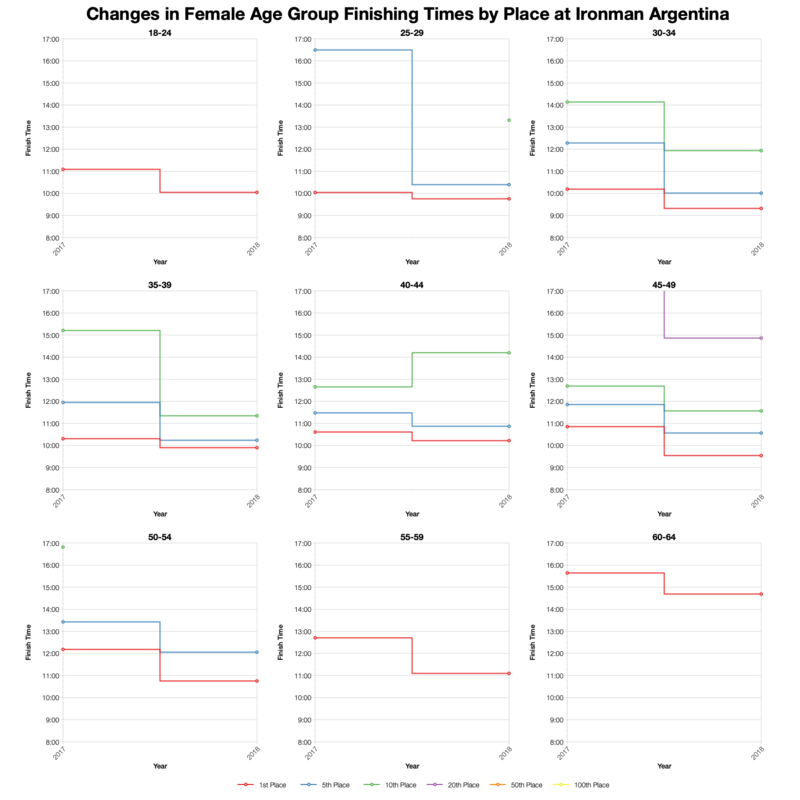 So while bike medians are often comparable, some age groups are noticeably faster. 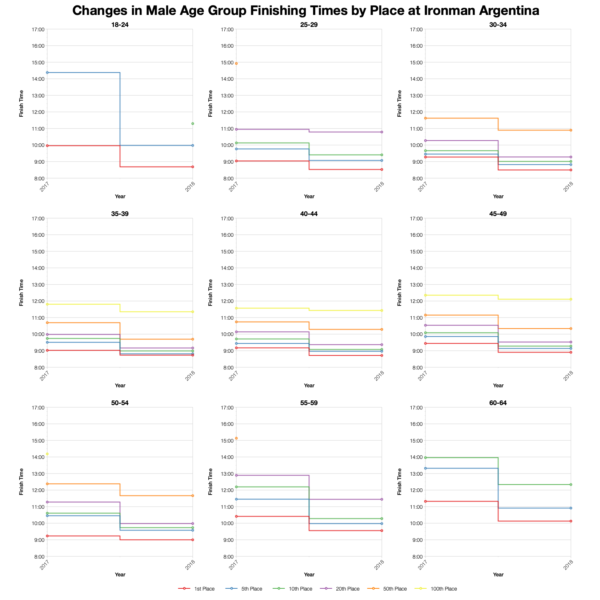 The bigger difference seen i the run distribution means most age groups are faster. 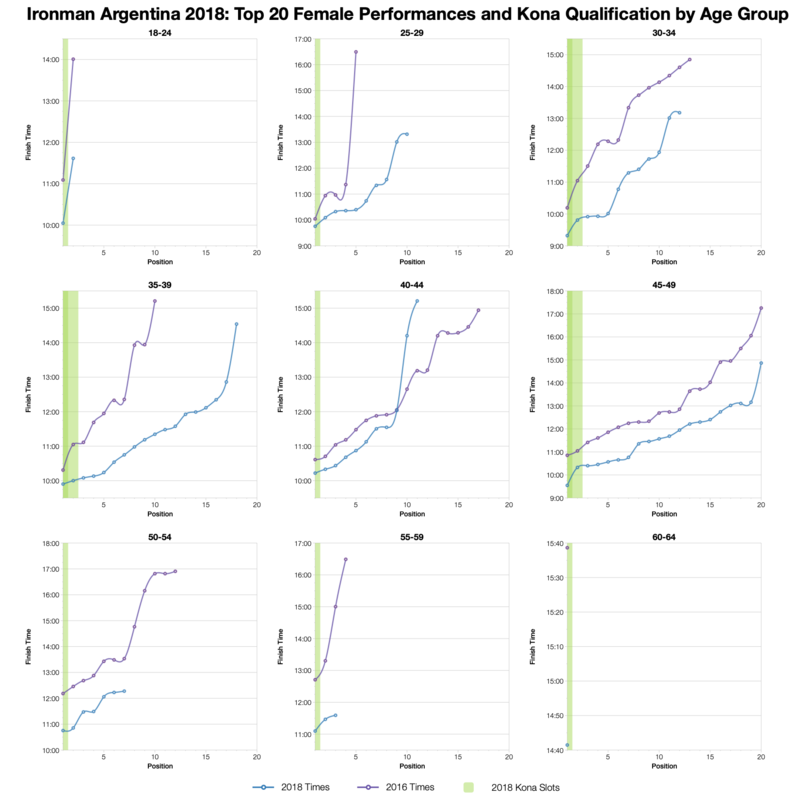 Argentina drew a very broad field of nationalities to race. Kona slots were spread wide among those nations too. This looks like many may have come for the qualification opportunity offered by a high number of slots and a small field. It’s a shame the shortened race makes it hard to draw any comparison of qualification times. 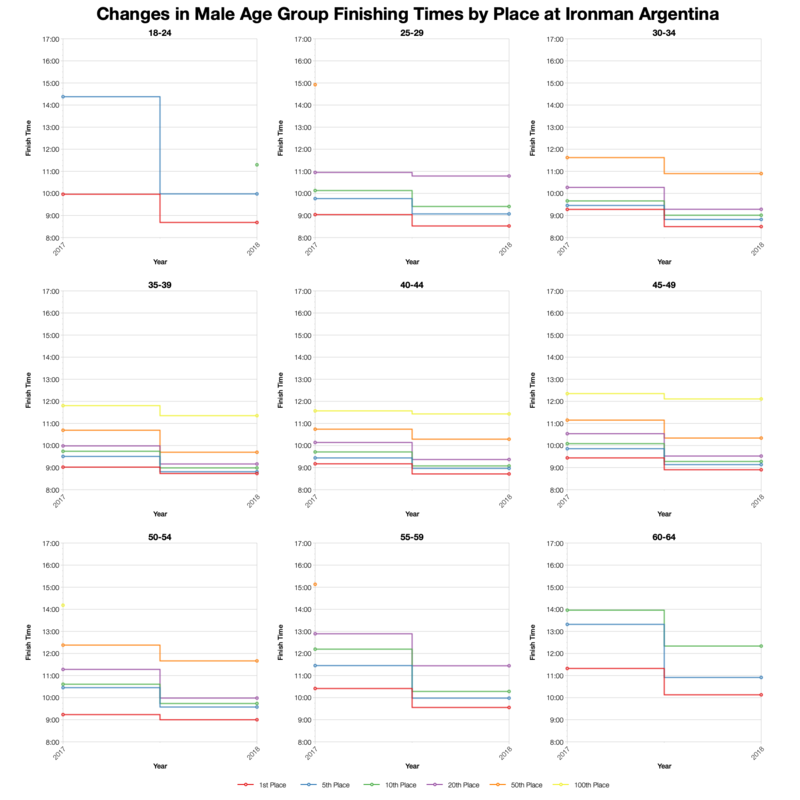 I’ve included the comparison of times for specific age group places at the two years of racing in Argentina. Of course, the course adjustments mean we only reinforce the picture of how much faster this year’s results are. Based on start numbers I’ve estimated the Kona slot allocation using the current method. Final times may vary with roll down. The shortened race means these times can’t be easily compared with other races on my Kona qualification page. Finally, the top twenty within each age group. Again, much faster than the previous year. The more interesting comparison might be the slope of these lines – for the larger age groups the differences between the top twenty appears to be less than before. That may indicate a tighter field at the front of the race, but a shortened race will also tend towards tighter finishing times. 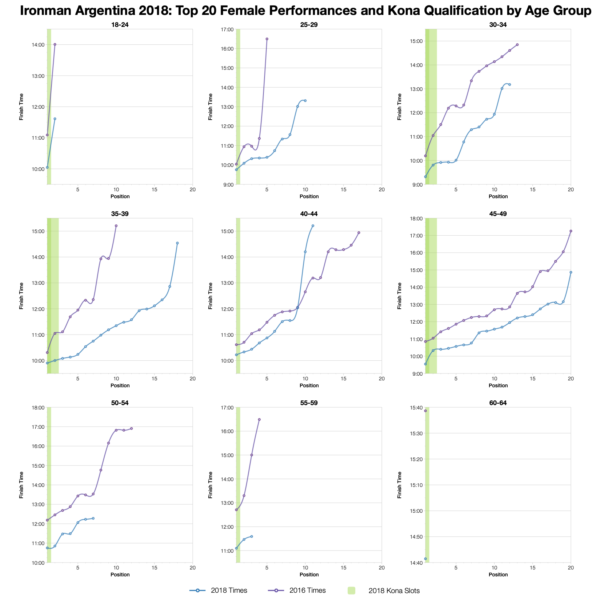 You can access a spreadsheet of the full results from Ironman Argentina 2018 on my Google Drive.